What is Wrong with Santa’s Eyesight? Why is it that every time we see Santa Claus, he’s wearing eyeglasses? It’s safe to assume there aren’t any licensed opticians at the North Pole, but what could be the cause of his seemingly poor eyesight? The eyes are delicate structures. Many environmental factors can interfere with proper functioning. It may be constant exposure to the Arctic’s cold, dry winds. Or it could be allergies. Perhaps Santa is allergic to reindeer dander. These types of influences can lead to dry eye syndrome. Another common cause of dry eyes is meibomian gland dysfunction. Of course, age, medications and medical conditions can also play roles. As people get older, the macula (the part of the retina responsible for your central vision) tends to break down. Macular degeneration results in reduced capacity to interpret fine details. So, if Timmy got a boy duck, instead of the toy truck on his wish list, Santa’s macular degeneration could be to blame. Santa may be dealing with haziness, blurriness, dark areas, less vivid colors and more. So, come on, cut Santa a break, and enjoy your duck. Santa is no spring chicken. Estimates put him at 1,746 years old. That’s way beyond the age at which most Americans develop cataracts. By age 80, more than half of all Americans experience cataracts. By the year 2020, studies estimate more than 30 million Americans will have cataracts. 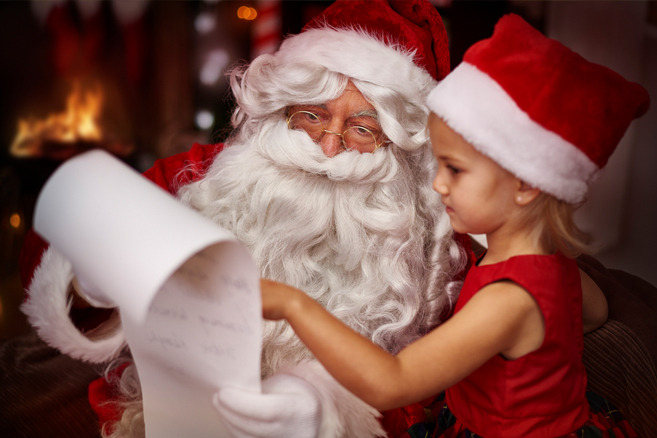 So, Santa likely has cataract symptoms including cloudy or blurred vision, double vision, halos, light sensitivity and more. No wonder he relies on his elves for much of the detail work. This holiday season, have a heart. Make sure to write your wish lists in big letters and maybe keep a light on near the tree for old Saint Nick. We’re all getting older and our eyes are aging along with us. If you could use a fresh eye exam leading into the New Year, contact North Florida Cataract Specialists and Vision Care today.